French high-end guitar co has unveiled a series of guitars that pay homage to iconic car designs. The 'Mexican Blackbird' Thunderbird 58, Mustang Shelby GT 500 'Eleanor' and Mustang GT 390 Fastback 'Bullitt' are all remarkably faithful to the cars they emulate, and accordingly, come with hefty price tags. See below for more info on each model, and visit Wild Customs for more. PRESS RELEASE: Billy Gibbons (ZZ top / USA) is an avid car collector and custom car enthusiast with an extensive collection that includes 1948 Cadillac Series 62 (known as CadZZilla), 1962 Chevrolet Impala (known as Slampala), 1950 Ford Business Coupe, and a 1958 Ford Thunderbird. Our Billybones Thunderbird is a tribute to that unmistakable custom car. 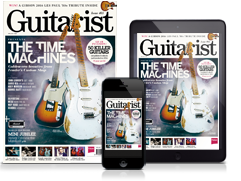 The November 2014 issue of Guitar World magazine features an interview of Gibbons and fellow guitarist Jeff Beck about their mutual appreciation of “cars, guitars, and everything in between”. The Billybone Thunderbird definitely yearns to be that “everything”. The Shelby Mustang is a high performance variant of the Ford Mustang which was built by Shelby from 1965 to 1968. For 1967, the G.T. 500 was added to the lineup, equipped with a “Ford Cobra” V8 engine with two 600 CFM four-barrel carburetors sitting atop a mid-rise Aluminium intake manifold. “Eleanor” is the only Ford Mustang in history to receive star title credit in a movie. The Ford Mustang featured in the original “Gone in 60 seconds” action film (1974) is a customized 1971 Ford Mustang Sportsroof. We’ve based our guitar design on the “Eleanor” featured in the 2000 remake of “Gone in 60 seconds” film where Nicolas Cage plays the master auto thief Randall “Memphis” Raines. The “Eleanor” featured in the 2000 remake is a Dupont Pepper Grey 1967 Ford Mustang fastback, depicted as a Shelby GT 500, with a customized body kit designed by Steve Stanford, the notorious automotive illustrator. We’ve based our guitar design on this iconic muscle car featured in “Bullitt”. “Bullitt” is a 1968 American drama-thriller film directed by Peter Yates. It stars the Steve McQueen and it is also notable for its car chase scene through the streets of San Fransisco, regarded as one of the most influential in movie history. Steve McQueen drove a Highland Green 1968 Mustang GT 390 fastback.